Air conditioning filters become wet, dirty and dusty. This makes an ideal breeding ground for fungal spores and viral infections such as small pox, chicken pox, measles, mumps, influenza and the common cold. We also have competitively priced new air conditioning filters for sale, including panels and multi-peaked bags, and all sizes of disposable filters. 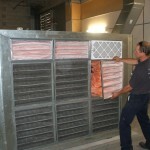 Call AM Coil today to clean or replace that dirty filter.